On the 50th death anniversary of one of the greatest Hindustani classical vocalists of all time (he passed into the ages on 23 April 1968), grandson Raza Ali Khan shares some lesser known anecdotes from his life. One of the greatest Hindustani classical vocalists of all time, Ustad Bade Ghulam Ali Khan is known beyond the circle of connoisseurs of classical music for his legendary rendition of 'Prem Jogan Ban Ke' in K Asif’s magnum opus Mughal-e-Azam (1960) and the thumris 'Yaad Piya Ki Aaye' and 'Ka Karun Sajani'. The genius is considered by lovers of classical music to be the Tansen of the 20th century not only for his unparalleled command of the ragas but also for his voice culture and his technical finesse, coupled with uniquely imaginative presentations of all the ragas he performed. Khan saheb is also credited with creating a legacy which every classical vocalist of the present era can count on to gain comprehensive knowledge of the art form. Apart from his records and his bandishes (short poems set to different ragas), which he penned himself under the name Sabrang, only a few anecdotes about the maestro from the Kasur Patiala gharana are well known. Chief among them is the popular tale behind the immortal creation of 'Prem Jogan Ban Ke'. When music director Naushad had approached him with K Asif’s proposal to lend his voice for the character of Tansen in Mughal-e-Azam, the master had initially expressed reluctance. Naushad was in a fix as Asif was adamant he wanted only Bade Ghulam Ali Khan for the song. So he told Khan saheb to demand a huge sum of money so that Asif would give up hope. Khan saheb asked for Rs50,000 for two songs. Readers must remember that this was an era when top playback singers such as Lata Mangeshkar and Mohammed Rafi charged Rs500 per song! To Khan saheb’s surprise, however, Asif readily agreed and placed Rs10,000 as advance. The maestro then demanded to see the rough cut of the film first. Thereafter, he wrote, composed and sang the thumri, which remains one of the treasures of Indian cinema. However, the lineage and lifestyle of the artiste with the eternal voice is hardly discussed. His grandson, Ustad Raza Ali Khan, the present khalifa of the Kasur Patiala gharana, a true descendant of his tradition, a not-so-popular yet accomplished composer, and a regular performer at important classical music festivals inside and outside India, offered a peek at the legend's background. Then there was Ida Khan, court singer at maharaja Ranjit Singh’s durbar, and Bade Ghulam Ali’s forebears from the paternal and maternal side, Ustad Ali Baksh Khan and Ustad Kale Khan, few of whose recordings are available today online. Kale Khan was popular in Calcutta, and among his disciples was the legendary Gauhar Jaan. “Dadaji started training under Kale Khan saheb when he was three or four years old," Raza Ali said. "But a few years later, his father suffered a stroke and was left paralysed. Dadaji then started playing the sarangi to earn and continued to practise vocal music. He would do riyaz [musical practice] in the Lahore fort, in solitude." 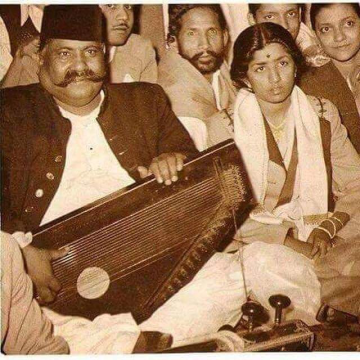 Bade Ghulam Ali Khan, a lefthander, was equally a master at playing the harmonium and the tabla. 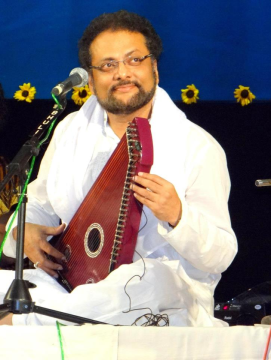 “As his father was a skilled dilruba player, Dadaji, who had a super brain, achieved similar perfection in playing the sarangi as he did as a vocalist,” said Raza Ali. His sarangi recitals, drenched in melody, left many of the courtesans of the day awestruck. Khan saheb came to Calcutta in the early 1930s along with his brother Barkat Ali Khan, another stalwart from the gharana known for his ghazals. He used to perform regularly at the mehfils, or closed concerts, organized by rich patrons such as Manmatha Nath Ghosh. Around that time, he first performed at the All Bengal Music Conference, where he sang raga Kedara. The rendition so moved the audience that the conference began to be called the Kedara conference. “As I have heard from my father, Ustad Munawar Ali Khan, from then on Dadaji’s fame spread around the country like wildfire!” said Raza Ali. A man with fine taste for beauty, fragrance and food, Bade Ghulam Ali used to go back to his hometown Lahore when his stock of pure ghee would run out, until one of his admirers made arrangements to import butter from New Zealand and make ghee out of it. In 1957, the great man was asked to omit the name of Ram from one of his bandishes by someone at Radio Pakistan. Hurt and humiliated by the communal sentiment, Khan saheb approached the then chief minister of Bombay province, Morarji Desai, to get him Indian citizenship. He then left Pakistan and began to reside at the posh Malabar Hill in Bombay, setting an example of a true artiste beyond prejudice. The ustad continued with his frequent visits to Calcutta, Hyderbad and Lahore as before. Bade Ghulam Ali was deeply in love with his first wife, Allahji Vai. The grief caused by her untimely death gave birth to the creations of 'Yaad Piya Ki Aaye', 'Ka Karun Sajni', 'Prem Ki Maar Kataar' and many other eternal compositions. Raza Ali recalled a strange incident of this period, “After my grandmother died, Dadaji one day was singing raga Puriya near a pond at Mahishadal [in the erstwhile Midnapore district of Bengal] in the company of Ustad Enayet Khan, Barkat Ali Khan and Mubarak Ali Khan. As he was singing, the listeners began to feel ill. Soon, Khan saheb's surmandal slipped from his grasp and he fell unconscious. That was when the others realized he had high fever. “He got cured by a pir saheb at Lahore," Raza Ali said. "The pir saheb told Dadaji that raga Puriya was producing such a negative effect in his vocal chords that it was making him ill and advised him to sing ragas of happiness and joy such as Yaman, Bhopali, Hameer, Jayjaywanti and Sahana instead. Most of Bade Khan saheb’s disciples were intimidated by him, leaving just the singing star Noorjehan and his own son Munawar Ali Khan. A great performer himself, Ustad Munawar Ali Khan lent his voice as vocal assistant in numerous performances with his father, touring widely around the world. The father-son duo's performances are some of the exemplary presentations of the tradition of Hindustani classical music. Bade Ghulam Ali was initially keen to participate in films as his brother Mubarak Ali Khan became a singing actor in films made in Lahore, a major centre for film production in undivided India and, later, in Pakistan. However, the members of the film fraternity did not welcome him, saying his art was too superior to be used for commercial cinema. Dejected, Khan saheb decided never to sing in films until Asif and Naushad managed to persuade him. Later Hrishikesh Mukherjee, too, approached him to compose the music for his film Anupama (1966), but Khan saheb said he would charge Rs1 lakh more than the fees of Shankar-Jaikishan and Laxmikant-Pyarelal, the top composers of the time. 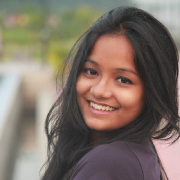 As a result, the project did not materialize and the music for Anupama was eventually scored by Hemant Kumar. However, Lata Mangeshkar, Mohammed Rafi and many other legends of the film and music world of Bombay were close to Khan saheb and spent time with him whenever it was possible. 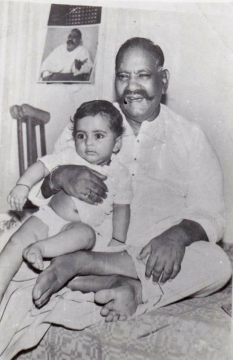 Raza Ali, who was a favourite of his grandfather, recollected, “Before I was born, Dadaji was ill. As I have heard from my elders, when he got the news of my birth, he suddenly felt a positive energy and sat up straight after a long time. He loved me a lot and used to pamper me. I used to fight with him and stealthily brought sweets for him, which he would always share with me. He used to say that music would thus be transferred into me from his soul. Known for his childlike yet powerful personality, Bade Ghulam Ali was struck with paralysis in the 1960s. However, when he got back to the stage after recovery, his flawless and consistent recital made all his listeners assume some miracle had occurred. In 1962, the legend was awarded the Padma Bhushan and the Sangeet Natak Akademi award. However, it is still a mystery what stopped the government from bestowing a higher honour upon the maestro.